Ridership on the Capital Metro system last year fell significantly, to levels not seen since 2011. "What we have is a proposal to take five of the busiest routes in the system and upgrade those so they operate every 15 minutes or better, from 7 a.m. to 7 p.m., every single weekday." It's called a Frequent Service Network, Hemingson says. The initial routes being proposed for higher frequency are the 7, 20, 300, 325, and 331. The board will consider the plan in the coming months and, if it's approved, the frequency upgrades could happen this summer. But there's a route that's notably not on the list for upgrades, one that the agency cut in half last year when it launched its first rapid bus. "It makes no sense that they're talking about the frequent service in 2015 while they took away that frequency on the highest ridership route," says Jace Deloney, Chair of the Urban Transportation Commission, which advises the city on transit issues. Deloney is talking about Route 1, which runs along the main arteries of the city: North Lamar, Guadalupe and South Congress. Capital Metro says they will not restore Route 1 frequency to where it was before the launch of the rapid bus service along the same route, even though the rapid bus costs 40 percent more, and the stops are much farther apart in many areas. "They're going to have to look into restoring the Route 1 frequency," Deloney says, "or else we're going to be hurting our best corridor going forward." One feature of those new rapid buses will soon be rolled out to the entire fleet. By the end of February, real-time location information for every Capital Metro bus and vehicle will be open and available online. You'll be able to see exactly where your bus is, and whether it's early or late. "I think there's a real hope that that will make transit service a lot more appealing to people that don't use it now," says Chris Riley, Vice-chair of Capital Metro's board and a former Austin city council member. "So I'm hopeful that over time it will become more and more a mainstream way of commuting." There are also significant upgrades on the way for the city's sole commuter rail line, the MetroRail Red Line. Thanks to some state and federal dollars headed Capital Metro's way, new trains, tracks and signaling will be added to increase frequency on the route, allowing it to carry more passengers, more often. Those improvements will take a few years. Hemingson of Capital Metro says those upgrades should allow the agency to double the capacity of the Red Line by late 2017 or early 2018. MetroRail represents 2.5 percent of the ridership on the Capital Metro system. Capital Metro is also partnering with the car and bike-sharing services Car2Go and B-Cycle to put their parking spaces and bike stations close to transit stops. That would help get passengers the "last mile" to their destination, Hemingson says. There's also that new express lane coming on MoPac, which buses will get to use for free. And Hemingson hopes to move forward on more transit priority lanes at the choke points around downtown, as well as more rapid bus routes. 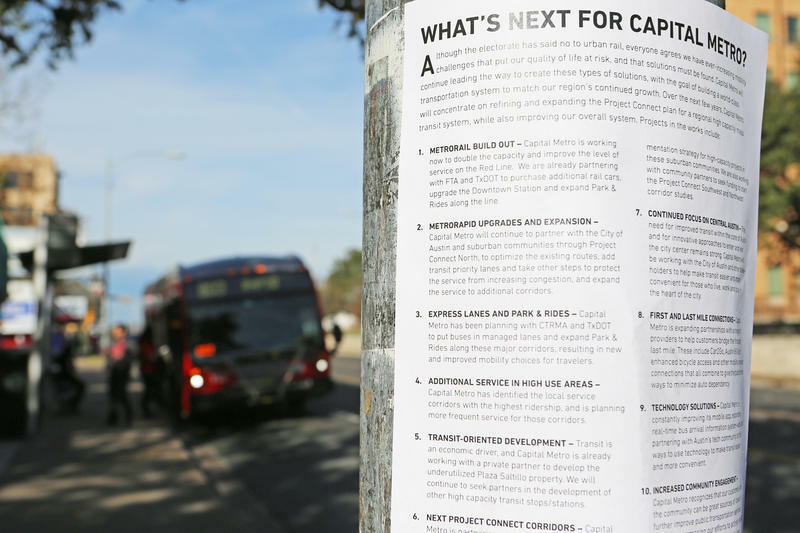 Those are just a few of the many things Capital Metro has planned. But what could they be missing? "My first advice to the Capital Metro board and the executives there is to start riding the service," says Deloney with the Urban Transportation Commission. "And look at how riders experience the city and the service that they provide." Capital Metro says they do not track how much its CEO, board or staff use the service, but that they are encouraged to ride. They note that Capital Metro CEO Linda Watson uses the service "as her busy schedule allows." "It should really start from the bottom," Deloney says. "The riders know the system better than anyone. 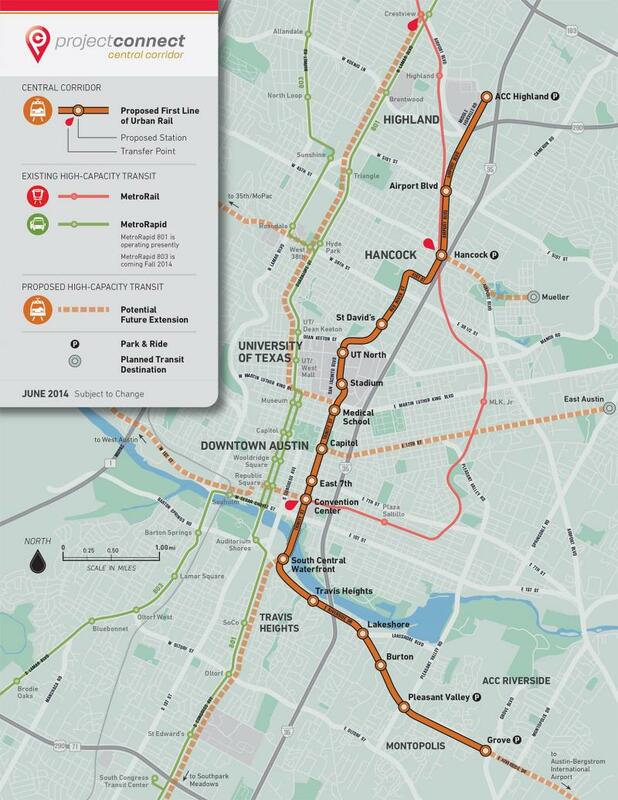 So all of the projects coming out of Capital Metro should start with those people." 2014 was a rough year for Capital Metro. 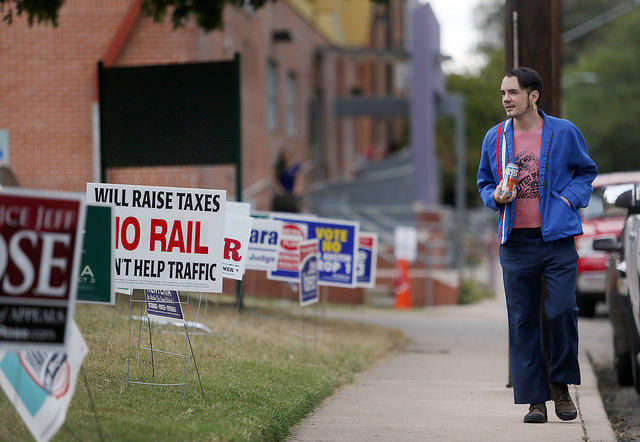 In addition to ridership going down significantly, voters overwhelmingly defeated a proposal for a new light rail line in the system, which has many watching and waiting to see what Capital Metro does next. This is the second in a two-part series on transit use in Austin. Read Part One: Austin's Growing Fast, But Why Isn't Its Public Transit?